This week we saw Mawson station transform into Mawson Concert Hall as Alice Giles fired up her harps for our entertainment. It really was something to behold. The program went for about an hour and there were plenty of eager listeners who showed up to experience this unique Antarctic concert. I have some very funny footage of my experiment with going outside in winds of over 55knots. Some of the fellows videoed me from upstairs as I attempted to move from the doorway down the steps – at the end Muzza came to the recuse like superman and I got a few meters before giving up while he went sailing off making it look all too easy. That was Wednesday – today is Friday, and although we were meant to be able to start helicopter flights back to the ship this morning, it looks now as though that won’t be until tomorrow or Sunday. The helicopter pilots need good horizon visibility as well as calmer winds. So I have all my equipment packed and am in limbo – “Hurry up and Wait” is one the Antarctic mottos. Luckily yesterday afternoon there was a slight lull in the winds, and a group of us walked out onto the West Arm of Horseshoe Bay, reached by walking over icy snow around the beach area to arrive at the smooth brown rocks of the arm. 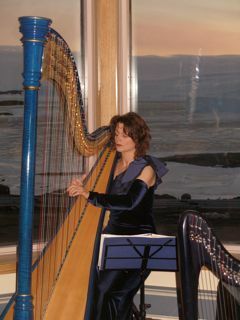 I think I was able to get some good recordings of wind through the baby harp strings in a sheltered and dramatic spot overlooking the icy sea and glacial cliffs of the other side of the arm, and continued recording and messing about until the weather changed – a light snow fall turning quickly to higher winds, and I struggled back with harp on my back over the ever increasing iciness. Walking in the high wind is a strenuous and exhausting experience, and I soon get very hot and puffed inside my warm down jacket. But rather fun too! Monday must rank as one of the most roller-coaster and challenging days in my career (running a tie with the day last year I missed my flight from Germany to Italy for a recital). Arose early to prepare for helicopter departure to Mawson Station. We were all ready to go on the helideck and I was just arranging for the harp to be carried down from the bridge when we received the news that all flights had been cancelled due to high winds and expected blizzard conditions. The voyage leader was also concerned that should weather get worse there would be too many people to get out of Mawson quickly before the ship would need to leave. So I had a very tense day in the knowledge that I had got so close but there was only a small chance I might actually ever get to Mawson at all. But late afternoon I was told winds had eased and I was scheduled to go out on the evening flight and return the next morning. Joy! – I was shaking so much with the relief I had to sit down in the ‘departure lounge’ to do a patience card game to get calm enough to walk to my cabin, repack for 1 day instead of 5, and try and have a nap. The harp was carried down from the heated bridge to a small sheltered alcove near the freezing helideck, where I was able to try and get it acclimatised to temp. -15C outside. The helicopter ride itself was spectacular – over 70kms of sea ice at sunset, with the beautiful mountains surrounding Mawson looming closer. The harp only just fitted into the helicopter passenger area (an S76 for machine buffs) and ended up half on the laps of the Korean film crew in the back, who were very charming about it. My heart was in my mouth when we arrived, as the wind was VERY cold, and the harp needed to be taken from the helipad by ute to the ‘Red Shed’. Once there I let it acclimatise in the ‘cold porch’ while I quickly unpacked and set up my electro-acoustic gear and the video and sound recording equipment. Without Rolf the very sweet and helpful incoming Met officer, I am not sure if I would have managed it all – one output on my Camac wasn’t working so I had to forgo the general output amplification and work with 3. The harp seemed fine apart from that, which was a relief. Just had time to tune and slip into evening gown, and ready to play at 11:15 pm, having had no warm up, not even a scale, all day! It was supposedly the last night at the Mawson Bar for the remaining Mawson Winterers (a few being already on ship) and they held the official changeover ceremony while I was getting organised. It was unfortunately dark outside already, but I was assured the morning would bring a beautiful view from the windows, so I arranged to do a repeat performance for early risers at about 5am. Just time to download and check my video recording, sleep for 2 hours and start all over again! But the view was indeed worth it, and it was beautiful to play in such a spectacular and special scene. As I was packing up everything imagining I would need to be ready to leave with harps and my 13 packages of equipment at any moment, I heard that all flights had been cancelled for several days due to incoming blizzard conditions, and that I was to be staying in Mawson along with the other Mawson departing expeditioners and helicopter operators! Of course I had a moment of panic, imagining what it would be like if the ship found it had to turn around and leave due to the poor conditions and icy seas. I imagined also how my grandfather would have felt trapped in an icy bay knowing winter had arrived, aware of all that would be missed by not getting home. I have been assured that the ship will wait, and of course there are many more people than just me in the same situation. As I look out on the frozen bay from the warm and sheltered comfort of the Red Shed lounge I imagine also how different it is now from 100 years ago. Last night I had a gin and tonic at the Katabatic Bar – coming from a ‘dry’ ship this was an extra luxury – with Antarctic ice hammered off, a slice of orange cut by hacksaw. We considered the difference between the current hardship of Mawson water rations (shower every second day, 4 mins max) against the once-weekly tub soak in front of the stove in the freezing hut during night watch that was the lot the first expeditioners. I have a phone in my room, and have been able to receive direct calls from family as though I was in the next street – no failed telegraph connections and morse code for us. And yet we are still stranded and would continue to be until next summer but for the 3 helicopters – 1 from the ship and 2 from Davis that we picked up for this purpose. Travel to Antarctica is still almost like travel to the moon. I wanted everyone to finally hear the whole AAE Centennial Celebration program including spoken words, rather than just small snippets of visuals with music. 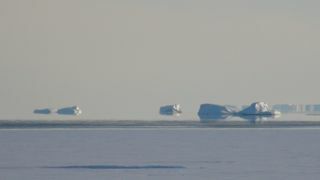 It was recorded at sunrise, so you will need to excuse the ‘morning voice’ in the dry Antarctic air and on 2 hours sleep! Also, pickups on one register of my harp failed on arrival, leaving me only 3 to use with no ability to plug in the 4th for any loop effect for Wesley-Smith – sorry Martin! – and the pieces without effect were then without general reverb, making them less resonant compared to the ones with effect. But hopefully it will give the general feeling for the program as a whole, musically and dramatically, as given for the first performance of harp on the Antarctic continent, and first performance of many of these pieces especially written (see program). The previous evening’s performance was marred by adjacent computer hard drive noise, bar fridge noise, and my having just stepped off a helicopter, so I did a repeat performance for some early risers. 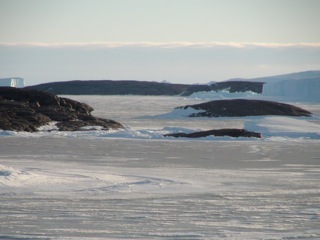 The sun was rising over the ice plateau and onto the view over Horseshoe Bay – a windswept bay with fast-(ie attached to land)ice amidst the dark brown rocky arms. 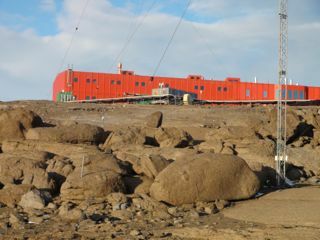 Alice is currently in Mawson Station with sporadic email capacity. At last report they were expecting a blizzard! 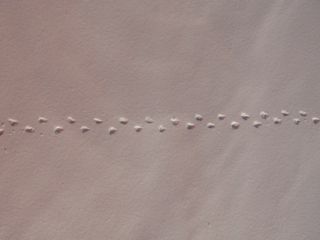 We expect to get photos and videos from Alice’s performance at Mawson soon. Today a place was set up on the ice next to the ship for cargo operations: containers were lowered by crane from the ship, helpers unloaded the containers, and helicopters landed to be filled and fly off to Mawson Station. I have helped in a small way by spotting helicopters on their way, signing people on and off the ice, and watching for cracks next to the ship – not very essential occupations, but an excuse to get down close to the ice and watch the goings on. It’s still very cold (around -14) so am trialling all my winter gear. At this temperature I will definitely not be playing outside unless the sun is shining directly onto my fingertips! 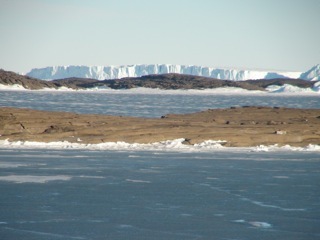 The beautiful mountains surrounding Mawson are clearly visible from here – dark with large patches of snow and ice, making some look a bit like orcas to me. Lots of people are already ashore, some will return tonight having had their stint on land. Tonight after helicopter ops finish, we will all be allowed down on the ice to play for a couple hours before dark: very exciting. I will be sending off my equipment (including laptop) tomorrow, so blogs will miss a day, and the harp will fly with me in the helicopter the next day.